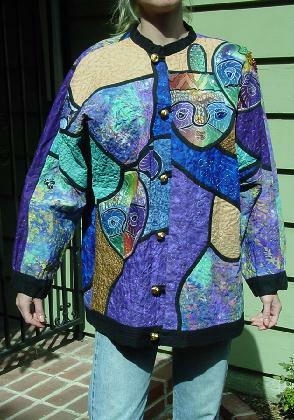 This custom-made jacket is in purple, peachy-tan, turquoise, rust, yellow, tan, mauve, blue-green, white, and black - it's a kaleidoscope of these colors, each outlined in black. There are multicolored threads in freeform patterns. The jacket has an Asian styling to it. There are 3 large face mask designs on the back with accent beads in various colors on 2 of them. There are also black accent beads on one of the black borders. There is a cluster of 3 cat face buttons with green bead eyes on the right sleeve. There are 3 face mask designs on the front, one on the right and two on the left. The two on the left have beads on them. There are 6 large gold buttons on the front. It has a band collar and band sleeve cuffs. The lining is in navy blue, muted red-orange, white, turquoise, light blue, tan, and ivory in oval and freeform shapes. I'm not sure what the fabric composition is, but it feels like a cotton blend. 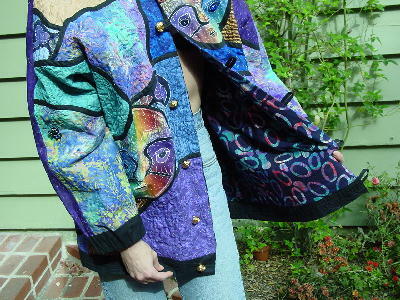 The jacket has shoulder pads. A stylist used to wear it when she went to Broadway plays and late night afterparties. She said the lining reminded her of Studio 54. Wear it over jeans, long or short straight skirts, dresses, or just about anything. You're not limited on the colors you can wear it with. It's definitely a striking jacket. 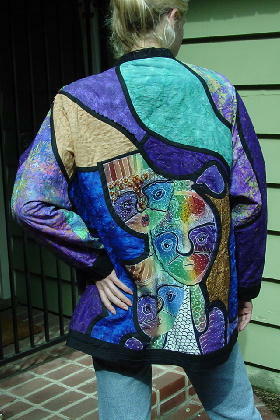 The jacket reminds us of the paintings of the artist Anatole Krasnyansky.